You are here: Virgin Islands News Online » News » NDP holds general membership meeting; Turnout poor! However, our senior NDP sources told our newsroom after the meeting that the turnout was poor, with some elected members snubbing the meeting and other attendees leaving before the meeting had concluded. The meeting was chaired by Mr Louis Potter- the party Chairman- and assisted by party President and Premier, Dr The Honourable D. Orlando Smith (AL). In attendance were Hons Mark H. Vanterpool (R4), Myron V. Walwyn (AL) Marlon A. Penn (R8) and Melvin M. Turnbull (R2). 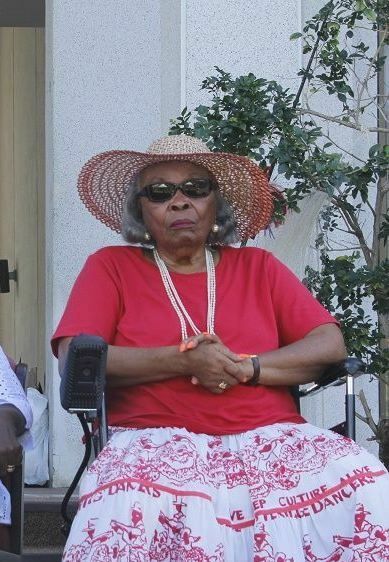 The other elected party members were absent or snubbed the meeting, leaving a handful of persons there, including former Legislator and cultural icon Mrs Eileene L. Parsons OBE who fired off a letter to the 11 elected NDP members last year. The story of the letter, in which she blasted the leadership and direction of the country and called for a new Minister of Finance, was broken by our newsroom. However, with less than 30 persons in attendance the party still carried on with its meeting. One of the many items discussed was the party’s constitution and the need to follow it so the party will have a proper structure. In addition, some members were of the view that the elected members of the party are not listening to its members or the public. It was agreed, coming out of the meeting, that a tentative date for a general membership retreat is February 11, 2017. 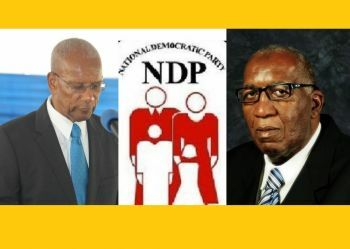 With the two main political parties in disarray after being undermined by infighting for power, many residents are calling for a third viable option to the NDP and the main Opposition Virgin Islands Party (VIP). The VIP last year November 2016 elected a new Chairman in the person of Hon Andrew A. Fahie (R1) and was gaining momentum. However, the party is now engaged in a civil war again over who becomes the Leader of the Opposition, a position held by Hon Julian Fraser RA (R3) who led the party into the 2015 snap elections that saw the NDP taking 11 out of 13 seats. The NDP was founded in 1998 and contested the 1999 election and won 5 seats out of 13. In the 2003 election the NDP took 8 seats, winning their first general election but lost the 2007 election, holding on to only 2 seats out of 13. The VIP won 10 seats with 1 independent winning but then joined with the VIP to give them an 11 to 2 majority. In 2011 the NDP won the election, taking 9 out of 13 seats and in the 2015 snap election the NDP took 11 of the 13 seats. There is also a civil war ongoing in the NDP over the succession to the Founding President of the party Dr The Honourable D. Orlando Smith, and most caucus members are reportedly not pleased with his current style of leadership. NDP as a Political Party is finished in this Country. They had too many chances to do the right things. @Myo. The VIP party has been working. Where's your faith. The execs chose a party leader in the name of Fahie. Fraser might not agree but we moving Forward. We are so distracted with this thing with Fraser that you're failing to see that this forty year old VIP party has already chosen their Chairman and it's healing, progressing and moving on. Have some faith and just believe this is a people's party. All lives matter and no soldier will be left behind. Welcome to VIP Myo. VIP died with Lavity! Maybe you should say a new VIP not the 40 year old VIP. I am not impressed and I welcome all The other new parties. Will make it much easier for NDP to win the next elections. Myo myo let's not be negative until the year is done at least lol. Be open minded, lets be honest what more do you want Fahie to do for the VIP party? When should he lead? Should he quit? Imagine if he quits now what would we do? He spent several years giving all we accountability things that would not see daylight. We are a people that give credit where it is due. History tells us VIP has a good run under Ralph when Lavity died. The party didn't die with Lavity. We still had prosperity until we asked for something new and we got Mr. zzzz and a disrespectful bunch that didn't listen to the people! VIP needs fresh blood but it still needs someone trained like Fahie. The man been working mehson. I fear a new party with no vision. Do you see anyone trying or just think a mere college degree make them smart enough to run this country. I urge you to have an open mind and don't sell this country out so fast again. Call it what you may but Fahie cannot run the show alone. Persons like you Myo will have to come together and move this country out of the mess created. We can call it the new VIP, but it's still VIP because we should never forget where we came from. My biggest fear with a new party is loosing our identity which we have somewhat under the NDP. Anyone who wish to form a new party and disrespect VIP in the process already is a traitor to our identity and not good for the Territory. Stop writing crap and get your own handle. You are polluting my message. "A third viable option to the NDP and the main Opposition Virgin Islands Party (VIP)" is a crucial choice at the rate both parties are miserably disappointing us. Yup, the ministers are NOT listening. Just like the democrats in the USA the election will be stolen, because the NDP don't listen to what us people wants. Mr Premier as a friend. Give it Up. Retire. Resign. Walk away. Hand it over to Ronnie a Simple letter. "I'm informing my Ministers, all my Parliament members, the party members and supporters and the general public that with_in 6 months I will retire from all aspects of government that includes as premier, I will rrecommend that Hon Ronnie Skelton take over the duties of premier, my resignation will take effect as of August 1st 2017. I wish to thank everyone for their support." ......Go back to what God has chosen u to be" the people's Doctor". Get yourself a new purpose fill happy life. I'm so happy that Alvera finally waking up. She is a sure winner she deserves better. Mr. Dawson. Ms Romney make your move start something new. We need something new. Contact Alvera. Contact Rawl. 4 u all come together in an agreement of confidence and privacy. Act as the executive for this new party. Amongst the four of you select a leader. Then select a committee to vet and include new memberss to the party. I'm telling you. This present VIP will not Win. doesn't surprise me. As director of TCPD for 25 yrs, potter didn't listen to people either and allowed horrible buildings to rise including the cinema building which is TOO BIG for the site. And they still there living in denial. It's about time we the voters send them packing. Message sent loud and clear. yeah hey sorry couldnt make it had a whole lota nothin to do! Any why are you here again? People are concerned about the direction the country is going. Why don't you contribute a solution if you have one, or get lost. NDP days are done. If I had seen them I would have run them out the building. What a waste of time and vote. Mark my words you fool the people once you won't twice. I never in decades seen my country like this. What a nightmare. New is not the answer. We ask for new and we got the ndp. Restoring our values and culture and way of life is what the people want. Not more lies, crime, poverty, disrespect in hoa and to people, self interest, globe trotting, tax and everything up, bad management bad roads over run projects no audit no transparency. Please send them elected members out to work and make ends meet like everybody else. Them so would have allowed the owner to loose UPs the other day and he got call letting them in the building. Get the hell out. @Wait. They would fall apart like Omar. They asked us for a second chance we gave it to them what some of us get. The rich get richer and the get poorer to put you all back in there only will create a bigger problem because it will not have enough people left to bury the dead. DOC if you just waking up from sleeping well we awake all the time watching and listening you all conducts especially the one who was trying to take bread out of a local mouth to put in a white man mouth and that is the gospel truth .DOC the ball is in our courts and we are going to strike out some so you all will not have that power to treat us like animals again. Like animals you right but let's not be bitter but wiser. Not my family vote again. Even after they come out we house I don't see how anybody could have any respect for them. It's like a history you don't want documented. I hope everybody wise enough not to make a sad mistake again. Doc needs to hire an exterminator and set some rat traps! WTF! We will know more in the next 24 hours, it seems. I think this is far from the truth. You got to give it to him man. Andrew has been working for all of us from day one. He brought transparency and held the ndp accountable. Come on man he's molded what more do we want. He has a god gifted leadership talent we should not throw to the side. Who else right now can restore our legacy. Please don't throw VIP away for something new again. Mark my words. We need visible community builders not anyone who see a quick free passage to power. I know we can build this country again but not by being ungrateful to our legacy. VIP is in all of us. We all benefited from the 1970s till now Andrew is carrying the torch. Don't allow the enemy to destroy us that's what the ndp wants and new party persons that were not even there. Let them respect our forefathers. Andrew has been working for himself. Can't be trusted. So did you benefit? Who you working for? Be careful that $100 come back to haunt you. Wise up and educate yourself. Stupidity is unacceptable in this country's current position. Don't allow anyone to take you for a ride. I pray for your wisdom. Speak up Deloris and Alvera. Speak up Ronnie, Kedrick and Archie. Where are your outrage now? You going let funny man tt man and Mr zzzzzzzz kill the party? Can we ban the ndp from running for office again? This party doesn't meet world standard. Shouldn't this fall under inhumanity, mismanagement and exploitation and terrorism of our hard earn resources. Who got access to the constitution? I need to know my rights. With all the head prices goin round i wouldnt show up either. I absolutely do not want to be anywhere near any politician for that matter because its truly ugly. It puzzles me that district 7 even bothering with Pickering. How could this district vote in Pickering so many times and his district is one the worst in terms of crime in the east? I'm saying since the Stickett was built which should be a positive thing there has been several criminal activities including murder a few minutes walk from his house. Can someone tell me what he did for the district other than state crime is responsibility of the police. This a question I would like an answer as I don't know? All you maybe know the man more than I do. 4 of 11 elected members showed up for a membership drive. Wow! What does this say? Does it say that the Premier is loosing control and has no juice? Out of respect for the Premier, should not the full slate should have showed up? No surprise though for Ms. P called for the Premier's head on a platter but yet to hear any member ( even brother-in-law) come to his aid, espousing support for him. Has the NDP's ship sailed? Is it time to fold up the rent? Rewind to NDP's mid-term last time around and this was the same thing. Everyone claiming never to vote for them again blah blah. NDP will win at least 8 seats next election and that's that. Win 8 seats. Lol. U can be right. It will only happen if they run against this present VIP. The legendary Jamaican artist Bob Marley been singing all along. Cline must know. Lets get serious, is it a coincedent that only the members whose first name begin with "M", were in attendance. Mark,Myron,Melvin, and Marlon. where was ronnie, defending Cline(nephew or co chinese) where was archie, trying to see if Andrew would select him? Alverra and Delores, campaigning kedrick,with his phone waiting on the son of Bran to reach the president(not louis potter) who all accomplished their mission, or went to hear andrew? try again without louis and see who comes. Equals OMMMMG what a waste. I sorry I wasn't they to show them the door out Elton place. Archie have a right to stay away. Sad Sad Sad. What appears to have FINALLY happened is that the very patient and forgiving people of the Virgin Islands have had enough. We will be complacent no longer! The government has pulled and stomped on the tiger's tail one too many times. In future, there will be NO politician elected who has said one thing and done another - EVER again. There will be zero tolerance for any more "done deals", or for those who steadfastly refuse to be held accountable for the truthful reporting and accounting of the territory's finances. Budgets will be presented on time and year end audits will take place ON SCHEDULE and as required by LAW! If this is not done, THE PEOPLE will petition the Governor to dissolve the government and hold a general election at the earliest possible date. Going forward, lies and answers such as; "I don't recall", or "I don't have the exact figures right now", will not be tolerated - PARTICULARLY from our Minister of Finance. The PEOPLE have learned their very costly lesson and in future will demand REAL answers to these very important questions from all future governments. Accountability, regular fiscal reporting, regular town hall meetings, truthfulness, inclusiveness and proper representation will be the standard DEMAND from each and every elected representative, in each and every district, not just a select few. The successful party will PROMISE to represent ALL the people ALL the time and they will be strictly held to that promise by the electorate. No district will suffer just because they did not vote for a particular party. Cronyism and favouritism will NOT BE TOLERATED when awarding government contracts. In light of our current government's propensity for socialistic oligarchism, bordering on communism, I don't know how long our capitalistic democracy will last. However, for now, we still live in a democracy, and it is every citizen's democratic right to insist that our leaders follow and obey the rule of law (to the letter) and to work within the boundaries of our constitution. The time has come that the people should DEMAND that our Government provide a properly (and satisfactory) formulated Bill of Rights, AND the Freedom of Information Act they have been promising all these years. If these things are not provided before the next election, the simple answer is to never elect ANY of them again! My guess is that we won't see that happen before the next election because the self-appointed foursome among the 13 elected members, simply don't want us to have either of those rights. It is time to take back our government while we are still able to! Well said. I would like to add not just sitting on they heiny "representing the people" but "listening and respecting the people". Right now the NDP faith is sealed. They will try to con us again. They will make promises from now to election and try another snap election but I hope our people remember bad habits don't change overnight. The bad habit of disrespect and making others feel inferior and fear in the house of assembly and outside. The fighting and wanting to fist down another elected member. The cronyism and outrageous firing of our people. The disrespect of hiding the true state of our economy and not giving the people transparency on projects. The ministers who tell us the economy sound and stable, our Premier who claim the economy robust. Our bias speaker who shut down our people. The corruption and cronyism. Don't care what this gang preach from now until election don't forget they true colors. There attitude is no different from slavery a little power make them do crazy things. As a people we should settle for more. When our money done and our country is ruined we all will be held accountable. Be careful what we wish for a new party. We need a government that understand our values and needs, a respectful government that don't step over its people. Who wants to go back to slavery because poverty, crime and a dictatorship lying government is not far from slavery. We are slowly loosing our freedom but it will not happen as we have strong men and women that will fight for better.